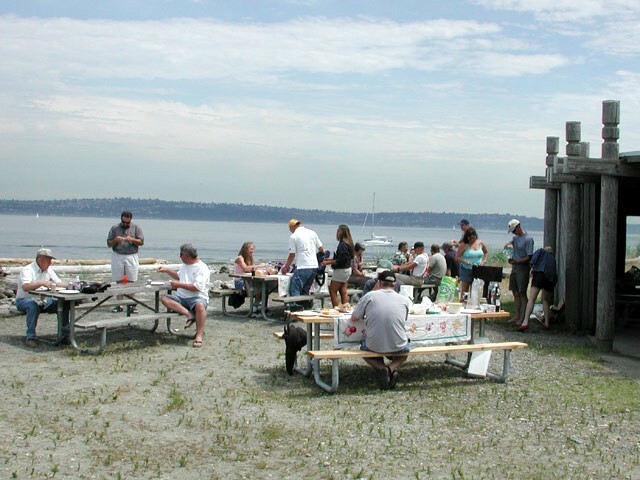 The many Boston Whaler owners and website activists of the Seattle area, led by Tom Clark and Taylor Clark, organized a great Whaler Rendezvous on Saturday July 13th, 2002. "The Rendezvous worked out quite well. The weather was nice and hot, maybe a little too nice as I got sunburned. You will NEVER catch me living in Florida.Too much damn sunshine. Myself and my girlfriend, Christina in my 1965 Cruisers Inc. 20-foot Super Vacationer. Jerry Scirica (Seattlerocket) in his 2002 13 Sport who deserves special thanks for saving the day by picking up the seafood at the last minute from Greg Cook (Tsuriki BW) who could not make it. Rodger Teed (Rodger) and his wife Babs and daughter Maria in their 1997 Dauntless 13, which is for sale as Rodger awaits the arrival of his new MT 170. Russ Hubbard (Russ) and his wife Fran who showed up in their newly acquired 1981 Revenge 22 which was the apple of my eye at the rendezvous. 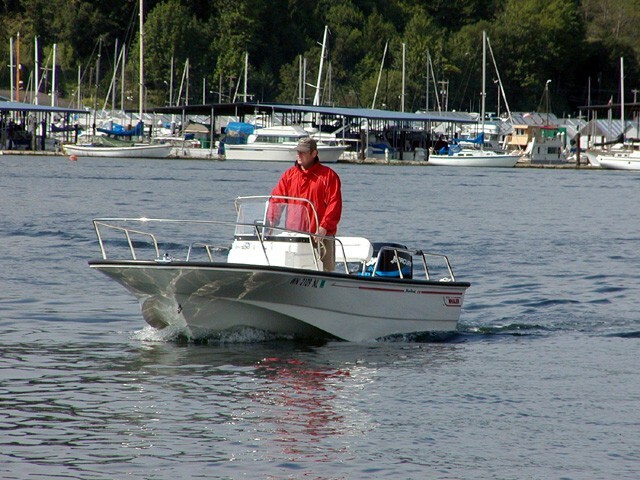 Russ has installed a very nice and heavy duty enclosure on his boat and has new electronics including an open array RADAR which will be perfect for fishing the western end of the Straight of Juan de Fuca around Sekiu where they spend their summers. Tom Birdsey (tbirdsey) who arrived with Russ. Tom wins the award for traveling the furthest to attend. He is from Albany, NY and was in the PNW visiting relatives in Gig Harbor. 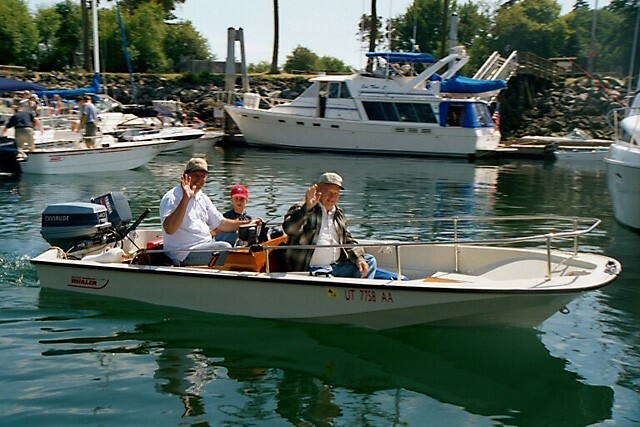 John Anderson (skookum point) with his father, Jack and his son, Jack in John's 1987 15 Super Sport. It was good to see some well maintained mahogany. A very nice classic indeed. Matt Irwin (Matthew) in his new MT 170. Bryan Snead (Bryan Snead) and his girlfriend Stephanie in Bryan's 1989 13 Super Sport Limited. My co-host, Taylor Clark (Taylor) and daughter Maighread in his 1988 Montauk who brought along potential Whaler owner Craig and his daughter from Bainbridge Island. Maighread seemed to be having fun with the other kids. This stands in stark contrast with her presence at the cutting up of CSW where she was ready to go home after about five minutes. Bob Selzler (Chaps) also showed up with two of his sons in his aluminum hardtop. Bob is a former (and likely a future) Whaler owner who lives on Bainbridge Island. 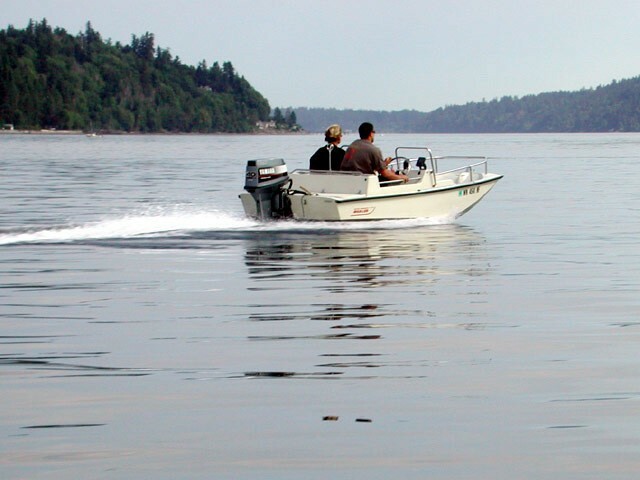 Bob was kind enough to deliver Craig back to Bainbridge in his boat after the rendezvous. 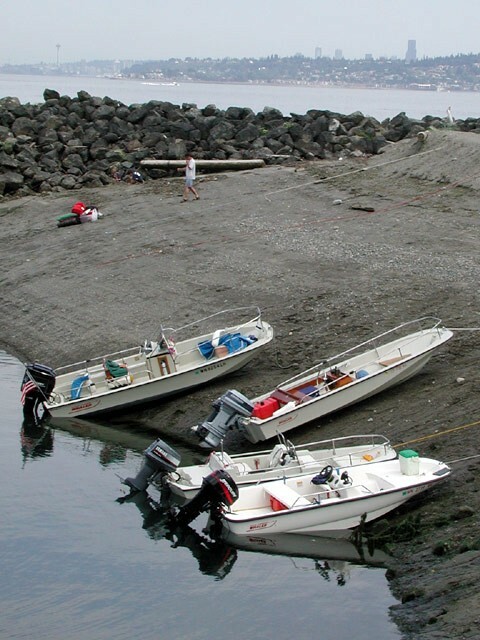 "Our only real challenge on Saturday was finding moorage for everyone. I was the first to arrive and pulled up to the loading dock and was greeted by the Harbor Master who let me know there was 'No Room at the Inn.' When I told her there were another ten boats coming she just about went ballistic. 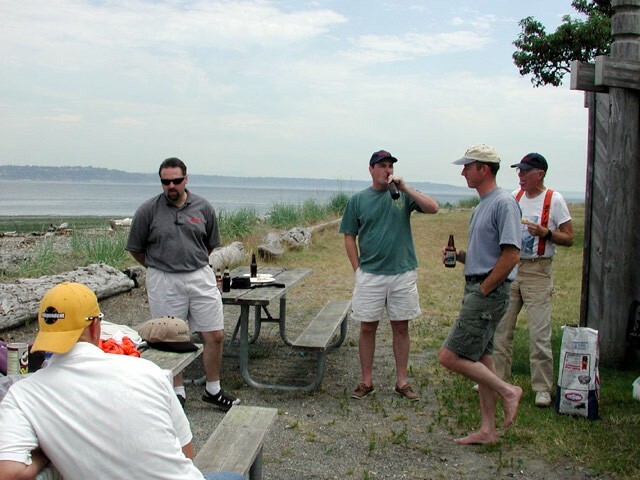 Larry and Jerry had already pulled in by then and I was trying to figure out what to do when a whole parade of Whalers came in from Port Orchard. "Eventually the Harbor Master and her assistants did accommodate us and we were able to put five Whalers and my boat on the dock. The other five Whalers were pulled up on the sand as the tide went out. "The sand at the head of the marina is extremely steep but I think Taylor's Montauk was the only Whaler that got swamped as the tide came in again and simply flowed up and over the transom. No big deal, Taylor just idled out of the harbor and then goosed it, pulled the plug and drained the water out in no time. Good thing he owns a Whaler. 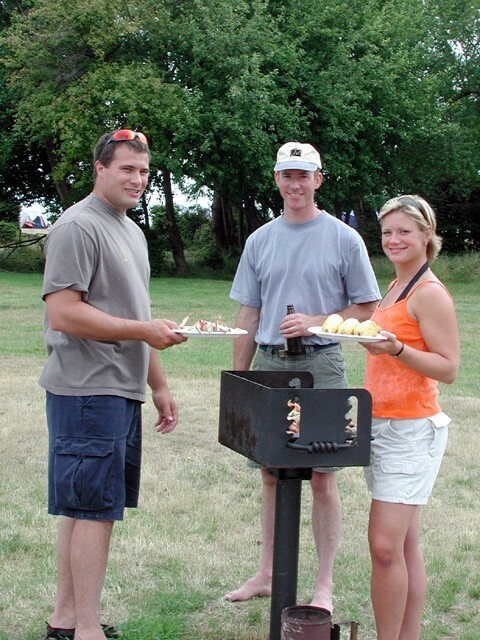 "We had a nice meal and chatted, and I especially appreciated the help of Babs and Stephanie and Bryan with the grilling of all the food as well as cleaning up. "I was given the chance to drive Matt's new MT 170. Brand new boats ARE fun to be in. Very smooth ride too. "Coincidentally, there was also a 13-Sport c. 1970 in the harbor with its owner who was a little surprised when the Whalers came parading in. His boat was all original. The gelcoat was very nice and shiny. While the wood was painted due to heavy checking in the grain, the rest of the boat was sweet. It's really nice to see old boats that are well maintained and not just repainted. "My biggest disappointment was that there was not enough time to fully inspect and discuss all the boats there. What with cooking and eating as well as delivering Tom Birdsey back to Manchester and going out for ride in the new boats I just didn't have time to talk as much as I would like to have with everybody. There's always next year though." Great event! Hats off to Tom and Taylor and all the others. Your turnout looks like the largest reported so far this year. Many thanks to John Anderson who did a great job in preparing , organizing and editing the photographs into the excellent digital images below. 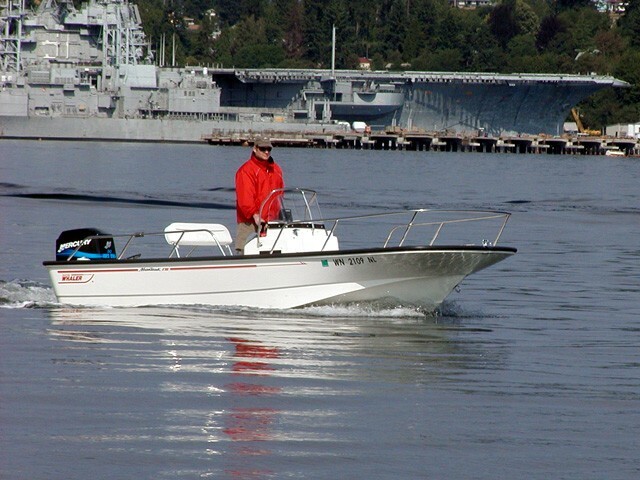 Here is a look at the Whalers of Seattle, the faces that go with the names, and a glimpse of what boating in the area has to offer. 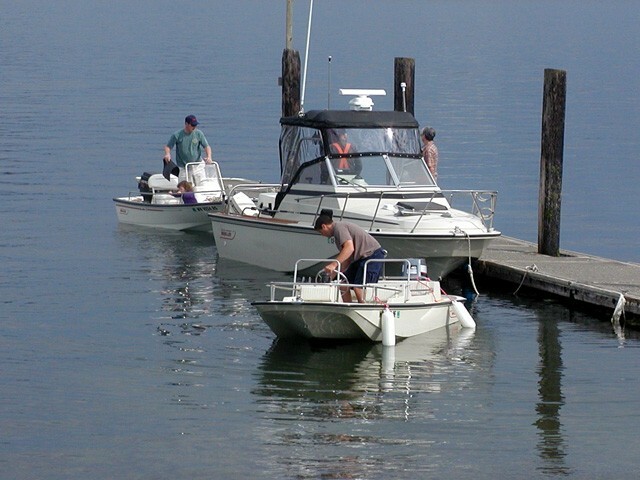 The boats begin to arrive at the Port Orchard launching facility. Russ Hubbard (Russ) and his wife Fran showed up in their newly acquired 1981 Revenge 22. Aft is Rodger Teed (Rodger) and his 1997 Dauntless 13, while ahead is Bryan Snead (Bryan Snead) in his 1989 13 Super Sport Limited. 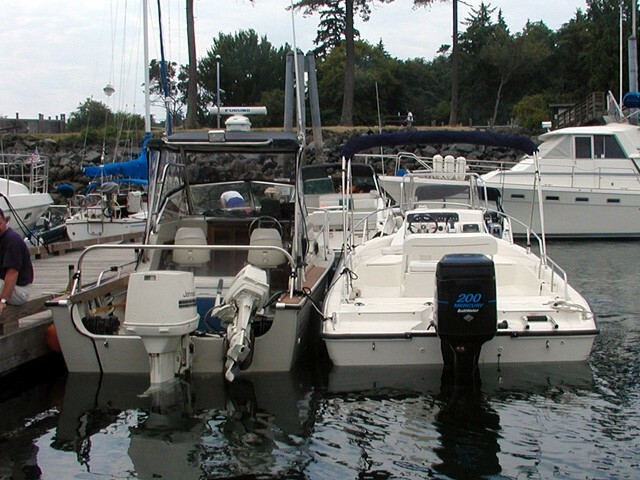 Russ has installed a very nice heavy duty enclosure on his boat and has new electronics including an open array RADAR. That will be great for fishing the western end of the Straight of Juan de Fuca around Sekiu where they spend their summers. 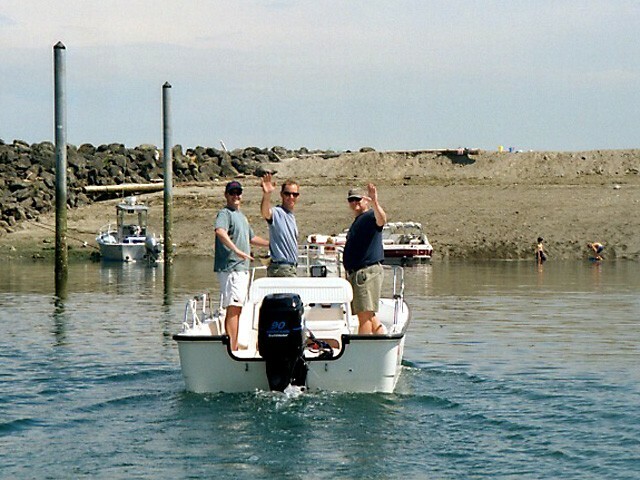 Matt Irwin (Matthew) joins the group at Port Orchard in his new 2002 Montauk 170. Port Orchard is across the harbor from the Naval base at Bremerton, WA. Yes, that's an aircraft carrier in the background. The new Whaler has more of a Fu-Manchu than a "smirk" when seen from this angle. 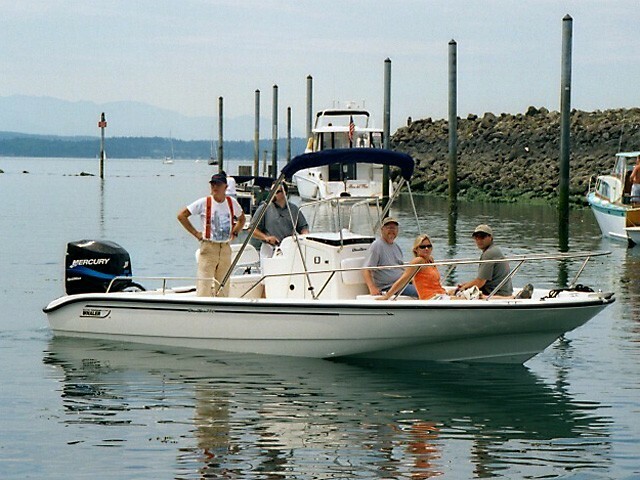 Rodger Teed (Rodger) and his wife Babs and daughter Maria en route to Blake Island in their 1997 Dauntless 13. That's a 1987 15 Super Sport in the background, with John Anderson (skookum point) and his father, Jack Anderson and his son, Jack. 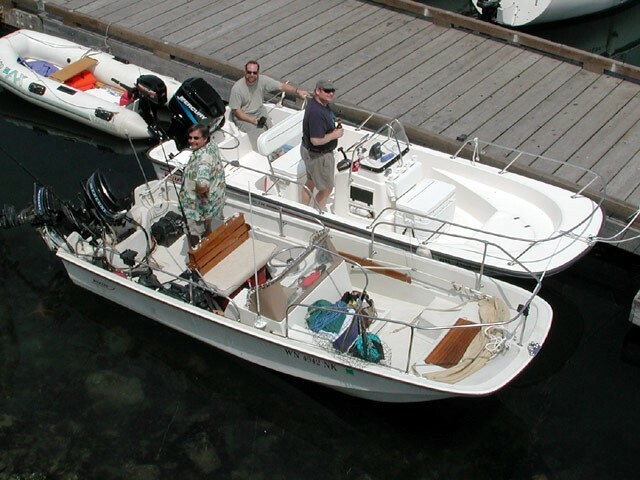 Rodger Teed (Rodger) and his wife Babs and daughter Maria en route to Blake Island in their 1997 Dauntless 13. Note the 'for sale' sign. Rodger already had his Montauk 170 on order. 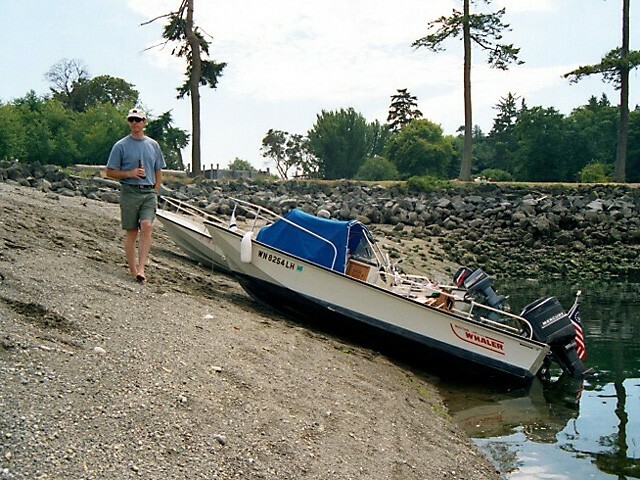 On the trip home Roger stopped in Olympia, WA, where a fellow approached him about buying the boat. Next weekend they closed the deal--talk about a Whaler being easy to sell! 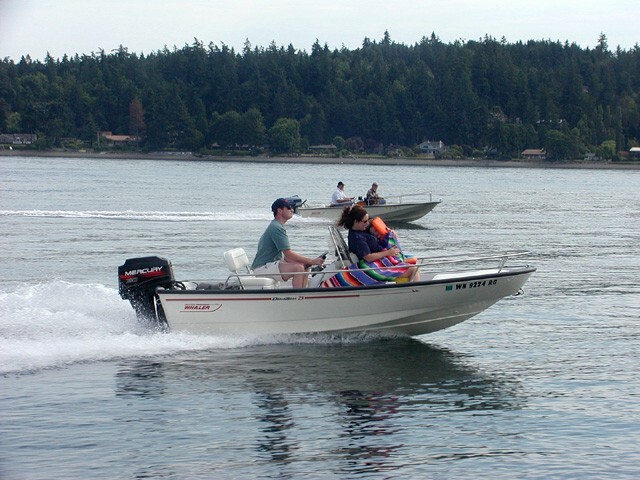 Bryan Snead (Bryan Snead) and his girlfriend Stephanie in Bryan's 1989 13 Super Sport Limited heading for Blake Island. Three generations of Andersons ride in their 1987 Super Sport 15. John Anderson (skookum point) with his father, Jack and his son, Jack. Now there's a Whaler with "smirk." Beached on a falling tide with the Seattle skyline in background: 1988 Montauk 17, 1987 Super Sport 15, 1989 Super Sport Limited 13, 2002 Sport 13. We had a minus 2.1 foot tide at 1:45pm the day of the rendezvous, so there is quite a bit of beach exposed. Tom W Clark keeps an eye on the situation while standing next to Taylor Clark's (Taylor) 1988 Montauk. 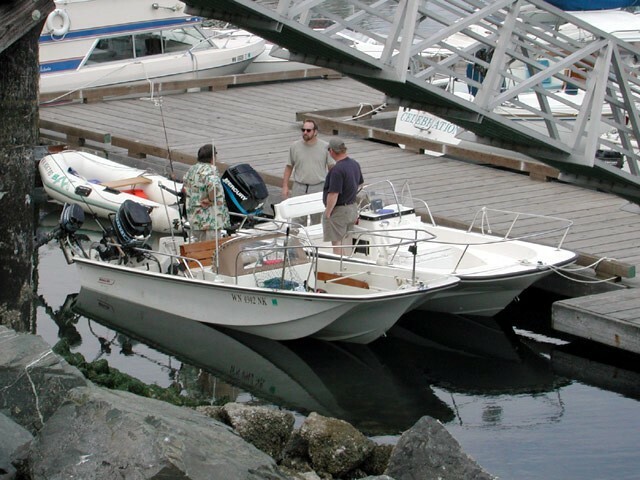 Larry Eaton (lae) and Matt Irwin (Matthew) compare Larry's 1974 Katama with Matt's Montauk 170 while Taylor tries out the stern seat. Comparing and contrasting Larry Eaton's (lae) 1974 Katama and Matt Irwin's (Matthew) 2002 Montauk 170. It looks as if Matt has not had time to put much gear in his new boat. Larry came all the way from Kennewick, WA to do some fishing. Larry's classic Katama next to Matt's new Montauk 170. This was a popular pairing at the rendezvous; we got to see the 1974 boat right next to the 2002 boat. Bryan and Stephanie cook corn and crab legs while Tom (center) anticipates the meal. Crab legs provided by Greg Cook (Tsukuri BW) and delivered by Jerry Scirica (Seattlerocket). 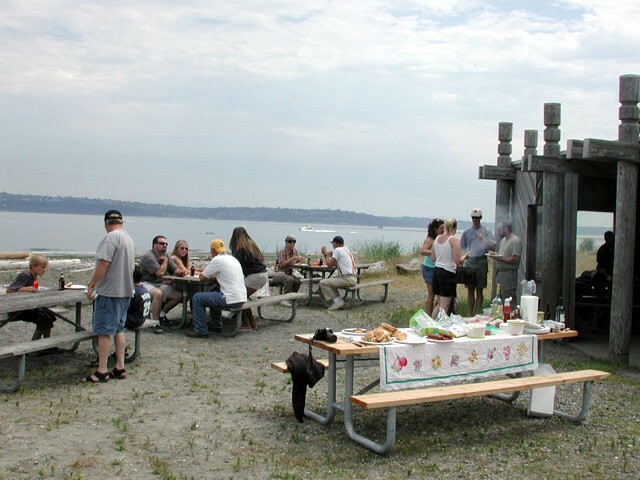 The pavilion at Blake Island afforded a panoramic view. 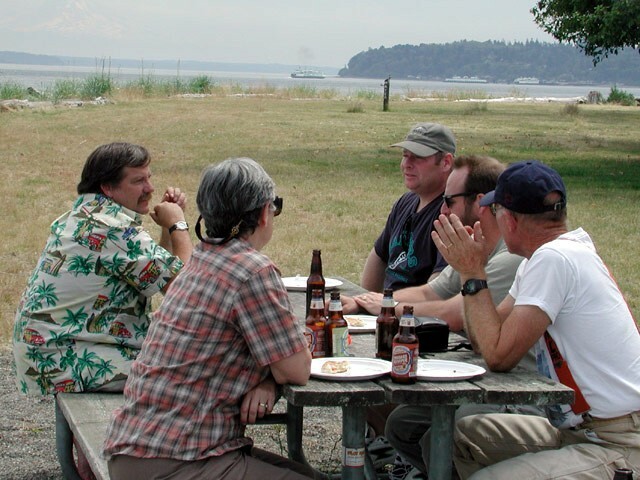 Left to right: Larry Eaton, Fran Hubbard, Matt Irwin (Matthew), Taylor Clark (Taylor) and Russ Hubbard (Russ). Standing at the left is Darren Largent (WHALER DUDE) from Whaler dealer Lake Union Sea Ray. Darren gave out Boston Whaler hats, shirts and mousepads. The Boston Whaler waterproof first aid kits were particularly popular with the kids. 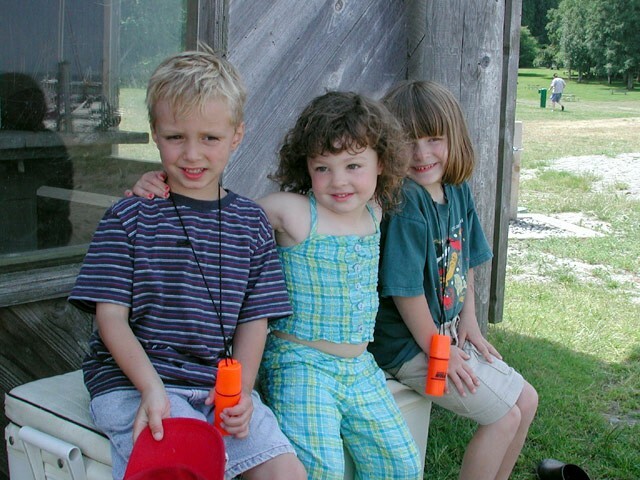 Jack Anderson, Maria Teed and Maighread Clark with their new BW waterproof first aid kits. 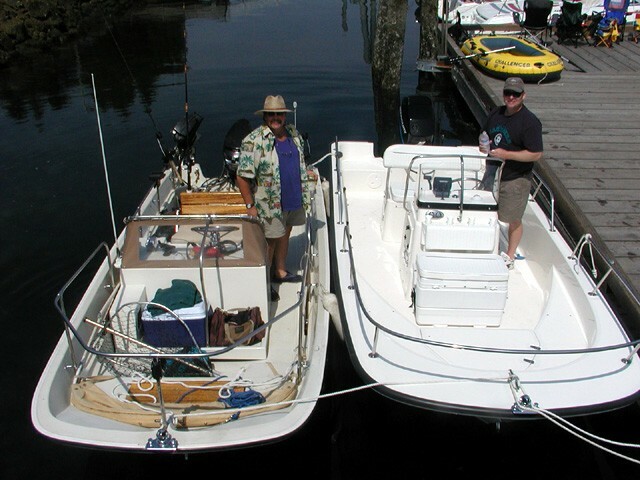 Another side-by-side comparison: The dealer's 2002 Dauntless 22 rafted up to Russ Hubbard's 1981 Revenge 22. 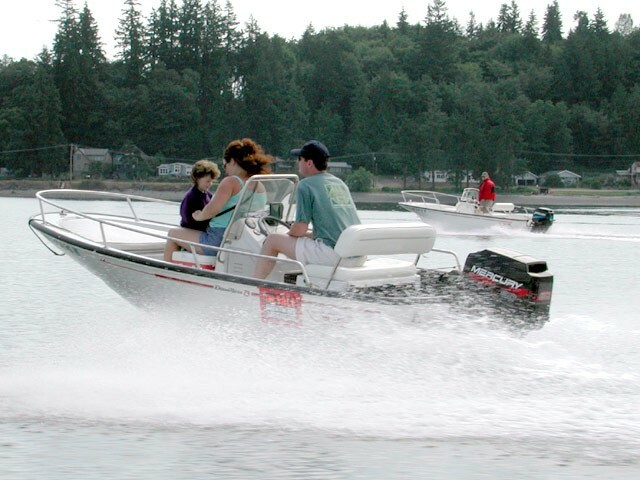 Darren Largent (WHALER DUDE) provided test rides in the new Dauntless 22 from Whaler dealer Lake Union Sea Ray of Fife, WA. Tom W Clark takes a turn at the helm of Matt Irwin's (Matthew) new Montauk 170. Rodger is along, anticipating his own new Montauk 170. 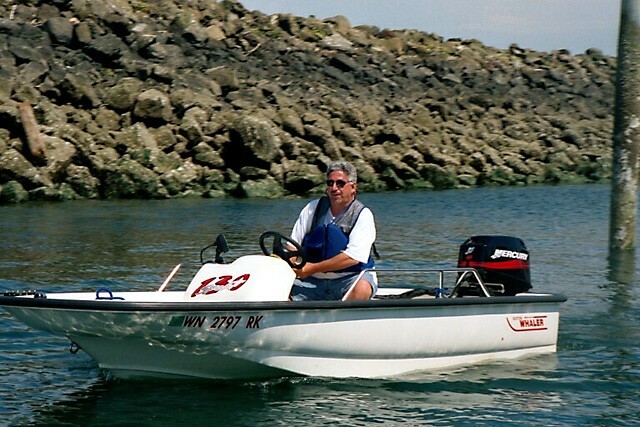 Jerry Scirica (Seattlerocket) heading home from Blake Island in his 2002 13 Sport. 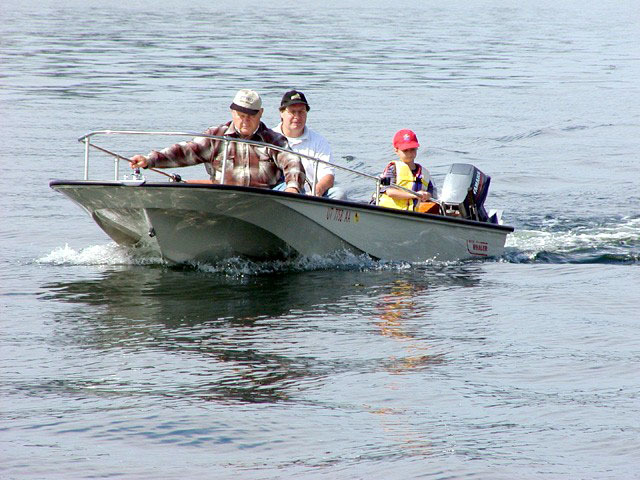 John Andserson (skookum point) with his father Jack, and his son Jack, heading home at the end of a enjoyable day. Note the Utah registration on this 15 Super Sport. The page has been accessed 52557 times.